OK, well, maybe they didn’t say that…or if they did, perhaps I should have my hearing or mental acuity checked…but the sentiment is still there. Some side dishes are just easy to put together and just make a ton of sense. These also happened to taste really yummy. 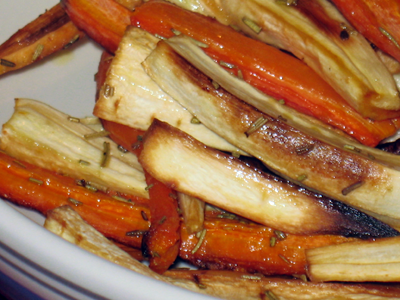 Roasting brings out the sugar in these veggies, and while you can go with probably any combination of root vegetables, I went with parsnips and carrots for some nice color and a good pairing of flavors. Were the kids more in the mood for making veggies the center of the dinner, or if we had more people at the table, the beets would have gone in the oven with them. 2. Drizzle olive oil over the veggies. Using tongs, toss the veggies so that they can get evenly coated with the oil. Make sure that you leave them in a single layer – no veggies should be on top of other veggies. 3. Sprinkle rosemary evenly over the veggies. 4. When the oven is at temperature, place the pan/sheet in the oven and cook for 30-35 mins. This entry was posted in locavore, side dishes and tagged cooking, CSA, eat local, locavore, vegan, vegetables, vegetarian by crunchymetromom. Bookmark the permalink.